Module 1: Expectations … Your Success! In addition, you are also expected to complete the module on the discipline-specific documentation strategies that is appropriate for your discipline. What is most important in this course is to take the time you need to really get the most of the information and what this course has to offer you and your team. Why me? No One Has Ever Complained! As you start this course, you may have been asked to take this course and wonder, “Why me? I document well. No one has ever complained!” This course is about excellence. Excellence for your career and for your organization as it serves others. 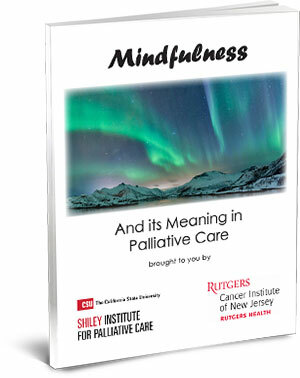 In the continuum of palliative care, documentation must rise to the level of an art form for practitioners. What is Excellence in Interprofessional Palliative Care Documentation? Just as great interpersonal communication skills are part of a palliative care practitioner’s skillset, so should be documenting effectively and efficiently. There are several reasons to strive for excellence in interprofessional palliative care documentation. With this course, you will increase your skill at documentation and as a palliative care practitioner. You will gain tips for documenting accurately and efficiently and you will gain best-practice templates as well as strategies that can be used to enhance documentation, improve communication and save you time. You will also learn new strategies for working together with your colleagues on your interdisciplinary team to enhance the effectiveness and usability of documentation… for everyone involved! This activity has been planned and implemented in accordance with the accreditation requirements and policies of the Accreditation Council for Continuing Medical Education (ACCME) through the joint providership of The Doctors Company and the CSU Institute for Palliative Care. The Doctors Company is accredited by the ACCME to provide continuing medical education for physicians. The Doctors Company designates this enduring material activity for a maximum of three (3) AMA PRA Category 1 Credits™. Physicians should claim only those credit(s) commensurate with the extent of their participation in the activity.